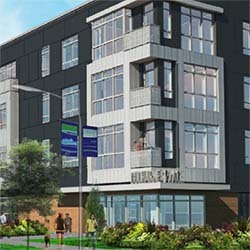 Construction is underway on DuCharme Place, a $42 million new construction apartment development just east of downtown Detroit in historic Lafayette Park. Local developer Walter Cohen, who developed Stroh River Place, The Park Shelton, along with many other complexes in Detroit, and his son, David Cohen, are developing the property. Detroit-based Sachse Construction is building the apartments, while Birmingham-based McIntosh Poris Associates is the designer. Cohen says the 185-unit apartment building, to be located at 1544 E. Lafayette St., will feature modern amenities including large closets, multiple bathrooms per unit, and open floorplans. He says almost every unit, either one or two bedrooms, has a patio or walk-out terrace. Apartment finishes include hardwood flooring, upgraded tile, and designer cabinetry with stainless steel appliances, in-unit washer/dryer, and built-in dishwashers. 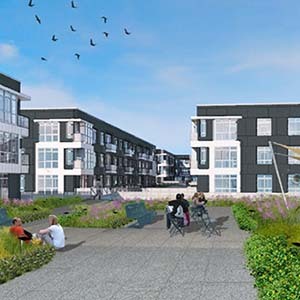 The four-story development, which sits on nearly 3.5 acres of land, will consist of four buildings that sit above street level. He says there is secure ground floor parking with one space for each bedroom of the apartment building. The property will offer a raised platform swimming pool, a Zen garden, and a fitness center. “The sky terrace on the second level is almost an acre and a half of green space, and there’s nothing else quite like it in the Detroit area,” Walter Cohen says. The apartments will rent from anywhere between $900 to $1,800 a month with tenants expected to start occupying the units in August. “I think (this development) will attract a new type of tenant into downtown, even potentially from the suburbs,” David Cohen adds.